Why does the moth get the accolade of sensor of the week? James Windmill from Stratchlyde University presents the case to Georgia Mills. James - Everyone has seen moths fluttering around a streetlight. But, did you know that the commonplace moth has one of the most sophisticated ears in the world? Georgia - Moths need to have good hearing, thanks to their predators – bats, who find them by using high pitched squeaks. If a moth can hear these squeaks it knows when it’s about to get got! James - To do this they have what appears to be the simplest possible ear; an eardrum with only a couple of sensory cells connected to it. As a mechanical sensor system, this would just tune to a set frequency range. Unfortunately then for the moth, some bats change the frequency of their sonar call as they approach their insect prey in order to get a better signal. However, some moths’ ears can change their frequency tuning when they hear ultrasound, pre-empting the bats’ frequency change, a feat no other insect ear can do. Georgia - Moths then can effectively tune in to detect the bats squeaks. But some other moths don’t need to tune their hearing. James - Other moth species have evolved incredibly wideband frequency ears, enjoying the highest frequency hearing of any animal on the planet. This allows them to not only hear any bat, but also pick out tiny ultrasonic chirps that their own species make to attract mates. Georgia - To put that into context, us humans can hear up to 20,000 hertz, mice can hear up to 70 000 hertz, and the greater wax moth can hear up to 300 000 hertz. This was only discovered recently by James and co, because previous researchers hadn’t been able to find an upper limit. And that’s not all. 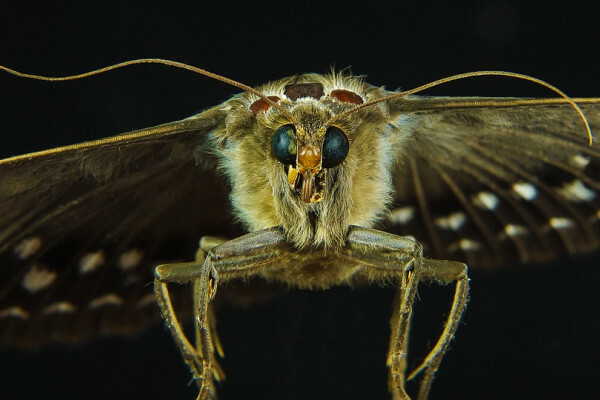 James - Very recently, it was discovered that one species of moth that makes their own ultrasonic chirps has ears that can separately tell the direction that ultrasound is coming from. All other animals use both ears together to get directional information, making that one moth species the only animal known in the world where a single ear gives it sound direction.